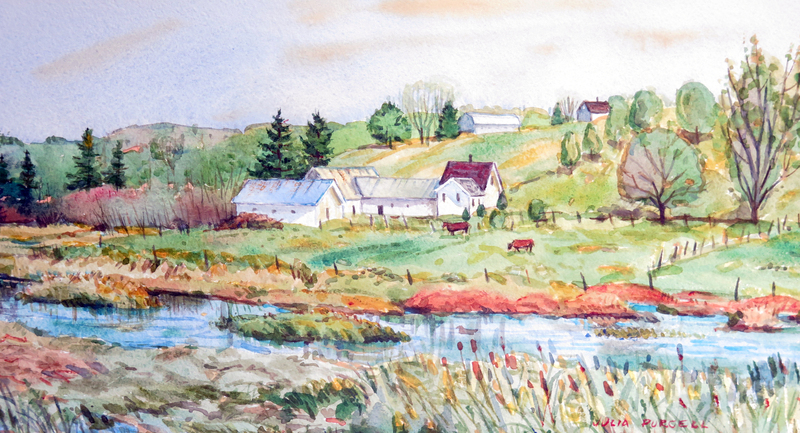 Clyde River artist Julia Purcell is leading a Plein Air event on Saturday, July 19th, 6:30 a.m. to 12:00 noon. The early bird artists will start at 6:30 a.m. but we welcome artists and those who want to watch art being created to drop by at any point during the morning. Coffee and muffins will be provided compliments of the Friends of Clyde River. The Island Plein Air Group of painters will join Julia. Whether you are a seasoned painter or a beginner, this “Paint Out at Art in the Park” adventure is for you. Photographers, poets, writers and other creative people are also welcome. The plan is to spread out around the fields and vistas surrounding Murchison Place Park to find the perfect scene. Painting demonstrations will be available with special tips on how to deal with wind, sun and rain when painting outdoors. Bring along your art supplies, easel, hat, sunscreen and lunch. We live in a lush and picturesque corner of the Island and we want to see it painted! The event will take place in sunshine or light rain. If there is heavy rain, then we will hold the event the next morning, July 20th, 6:30 a.m. to 12:00 noon. Meet at Murchison Place Park at the Corner of Clyde River Road and the Trans Canada Highway at 6:30 a.m. Parking is available across the road at the Clyde River Presbyterian Church. For more information, you can call Julia Purcell at 368-7526. For most painters, painting is a solitary activity; the fewer the distractions or interruptions, the better. But, once in a while, it’s fun to plan a “Paint Out” with fellow painting enthusiasts. “En plein air” was a term the French Impressionist painters used in the late 1800s to denote the then revolutionary idea of getting out of their studios and parlours to paint outdoors.